The Emergency Shut-down Valve (ESDV) skid is designed to shut in flowlines and protect equipment downstream in the event of an upstream failure or surge. 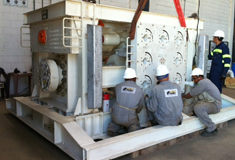 Major components include: subsea ball valves with mechanical and hydraulic connections, subsea swivels to accommodate rotation during installation, load-transfer skid to accept loading during installation, a protection structure and an ROV-interface panel. The interface panel allows hydraulic actuation of either swivel or the ball valve. Each of the three circuits has a dedicated hot stab port and hot stab plug. The ball valve features a mechanical override that utilizes a torque bucket interface. The assembly is an in-line style with integrated 17SV flanges for tie-in to the risers. In-line shut-down system with integrated load-transfer skid and lifting eyes. ROV operable with easy-to-read control panel to ensure all functionality. Integrated 17SV flanges and swivel permit pipe rotation during installation while the skid remains vertical.